If you work in a client-side insights team, then this is a ‘must read’ book for you. This relatively short book is based on interviews with leading figures from the industry and highlights the need for change in the way insights is conducted. Indeed the message is ‘change or die’. 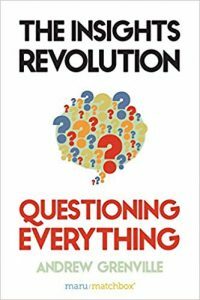 The book starts by setting the scene, briefly recapping the history of insights, highlighting that what we did in the past was correct in the past, and showing why it is wrong now. The second chapter is perhaps the most important in the book; it exposes the weaknesses in the way that insight teams relate the rest of the business. The book shows that insights teams tend to be order takers, rather than being proactive. To summarise, a stakeholder asks for the wrong thing (because they are not aware of all the options), the insight team delivers it, the stakeholder is disappointed because it does not help the business take an action, and the insights team are disappointed because nothing is done with their research. As a consequence, more decisions are made without insights, and the insights team are seen as a cost centre that is of diminishing relevance to the future of the company. The book shows examples of new options. These new options are the revolution that Grenville flags up in the book’s title. He urges people to question everything that has been done in the past. He shows examples of insights teams that have changed the way they work with stakeholders, how insights can move away from surveys and focus groups to synthesising multiple sources, and most importantly of all he urges insight teams to move away from thinking in research terms to thinking in business terms, valuing EBITDA more than research lore. The book backs up its message and recommendations by drawing on a host of interviews with brands as diverse as Discovery Channel, Coca-Cola, PwC Consulting, Twitter, Visa, World Vision Canada, and Virgin Australia. Other sources include published studies that highlight the weaknesses of many current methods of doing insights, interviews with some of the big names in market research, and reference to NewMR sources too. I have said it is a ‘must read’ for client-side insight professionals, but it is a valuable read for anybody involved in the supply of services to these people and anybody teaching the insight professionals of the future. You can buy the book in paper and eReader format from Amazon, here is the Amazon.com link. I have known Andrew for several years, for a period of time we both worked at Vision Critical (and worked on projects together), I was interviewed for this book, and I did receive a free, signed copy. NewMR will be asking Andrew to take part in a Webinar in 2019 to explore the issues in his book further.